When you rarely eat and bake cakes but wish to make the healthiest birthday cake for your loved one suffering from allergy, what would you come up with? These are surely testing times for you, but you want to give the best. When I was faced with this situation, I ended up baking a refined sugarfree, dairy-free ragi cake. that was compared with Britannia chocolate cake, to my surprise. Believe me, friends, this is the healthiest, yummiest, and best-naked cakes I have ever baked. I rarely make or eat cakes, but I must admit, I ended up with guilty indulgence this time. 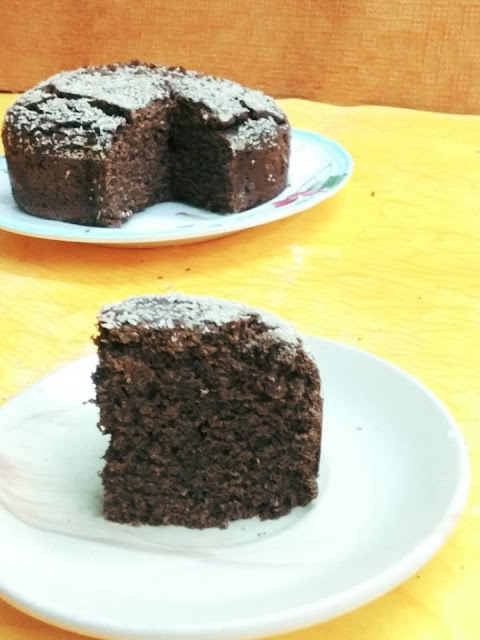 The ragi chocolate cake is light, not too moist or fluffy, but an absolute delight for vegan cake lovers. I have not added baking powder here, because I always want to avoid harmful chemical agents in my recipes. On top of it, when you are baking for someone with allergy issues, you have your job cut out with the type of ingredients to use. I am happy my ragi carrot cake came up beautifully and delighted the one it was baked for. Mix flax meal with hot water. Mix and add coffee powder. Keep aside. Preheat the cooker for 10 minutes. If you are baking in a convection/otg/airfryer/oven, preheat the same for 10 minutes to 180 degrees. Add coconut powder, 1/2 cup water, oil, and jaggery powder in a mixer/grinder and process for 2 minutes. Add the flax meal+coffee mix and again process until everything is incorporated. Add black salt and mix. Sift ragi, besan, baking soda, and cocoa powder 2-3 times. Make a well in the center and pour the wet ingredients in batches. Fold the batter. Do not overmix. Overmixing the batter will result in a dense/hard cake. Add carrot and fold again. If the cake looks dry or too thick, add 2 tbsp of water. Grease a baking pan/mould and dust with flour. Tap the baking mould 2-3 times to release air bubbles. Place the baking tin inside the cooker. However, place a cooker stand inside. I did not add a sand/salt layer at the cooker base, but you may spread it. Spreading a layer of sand or salt will help in even baking and speed up the baking time. Since I didn't add a salt/sand layer, it took my cake 1 hour to bake properly. If you do choose to add a salt/sand layer, your cake may be done in 40-50 mins. Remove the whistle from the cooker lid and cover. Bake on a high flame for the first 5 mins. Lower the heat after that. Keep baking on a low flame. Insert a knife/skewer in the cake after 40mts to see if it is baked from inside. If not, continue to bake further. When done, remove the cooker lid, turn off the flame, and cover the cooker with a cloth/kitchen towel for 5 mins. After that, remove the cake tin from the cooker. Let the eggless cake vegan cool down, unmold and place on a cooling rack for 1 hour. 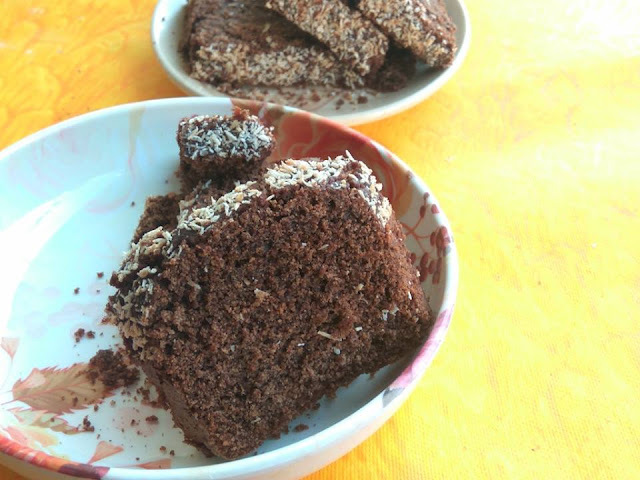 Cut into slices only when the vegan ragi cake has cooled completely. Enjoy the vegan refined sugarfree cake.